A journey of five miles east of Cedarville will land you in the high desert of northeastern California. The Warner Mountains and Nevada’s Hays Range border this remote getaway. Fed by an artisan mineral waterfall, Surprise Valley Hot Springs is a fourth-generation, family owned resort. A multitude of unique villas ranging from standard to suites gives the guest their own personal experience. Private soaking pools nestled into the back patios of each villa allow guests to star gaze while relaxing. Some of the villa suites offer indoor or outdoor soaking pools, whatever your preference. Enjoy a kitchenette or full kitchen as well as wifi or a massage during your stay. 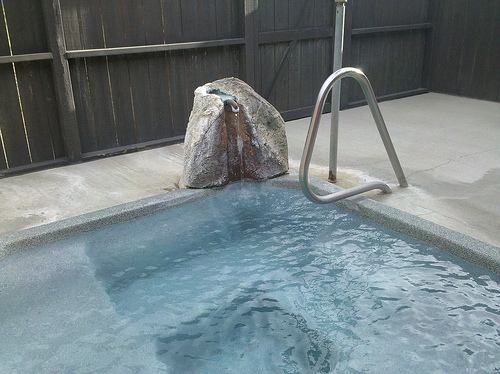 For those who like to fly, Surprise Valley Hot Springs offers a “Fly-n-Soak” Package! Eastward bound from Cedarville, California, drive 5 miles on Highway 299. Shortly after crossing a dry lake bed, you’ll come across the entrance sign for Surprise Valley Hot Springs. Continue on for about a mile to reach the hotel and your destination.